If you have basement water issues, then the only thing standing between you and a wet, flooded basement may be your sump pump system. If it breaks down, malfunctions, or clogs (and you have no battery backup sump pump), then you could be in for a long night. There's a lot to learn about a sump pump system, and like any other product, the more you know about it, the better decision you can make on a purchase. As a member of the Basement Systems International Network, Silver River Basement Systems of Colorado & New Mexico has the support of the largest waterproofing contractor network in the world. We use the most proven, reliable sump systems on the market, and we benefit from the knowledge, research, and experiences of waterproofers all over the world. For a free sump pump installation estimate in CO & NM, call or e-mail Silver River Basement Systems today! 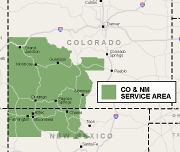 We service Durango, Grand Junction, Farmington NM and other nearby areas in Colorado & New Mexico. A reliable sump pump is a lot more than a simple pumping system. A sump pump should have a reliable, airtight liner, a sump pump alarm to let you know of failures, and sump pump stands to keep it off the bottom of the liner. The system should be equipped with a proper discharge, and it should be quiet, effective, and able to drain water from plumbing leaks. If you don't have a battery backup pump system, your home is literally one power outage away from a flood. And what happens if your discharge line freezes in the winter? These are things to keep in mind. What should you expect when we install a sump pump in your home? To begin, our expert sump pump contractors will dig a trench around the interior perimeter of your home, removing a small section of the floor and digging out the space underneath. A clean bed of stone is laid on the bottom, and a sump pump drain is laid on top of the stone. 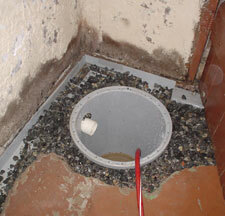 The sump pump pit is then installed, and a discharge line is run to the outside of the house. Our sump pump systems include the entire package- from a durable liner, to a special innovation on the traditional French drain design. Also, we can upgrade everything else in your basement as well, including the windows, walls, and floors. Silver River Basement Systems of Colorado & New Mexico provides patented, award-winning sump pumps in all of our waterproofing systems. Our product line includes primary sump pumps, backup sump pumps, and battery backup pumps that are literally capable of pumping out more than 11,500 gallons on a single charge! We also have a unique crawl space sump pump that's designed to be compatible with a vapor barrier. Our pumps include a cast-iron design, extremely sturdy liners, and sophisticated sump pump alarms. Each of our systems includes Zoeller sump pumps- which are the industry leader in reliability. Your sump pump can fail in many ways. From a clogged system, to a mechanical failure, and power outages. If you're asleep, at work, or on vacation when your system fails, you might not find out there's a problem until the basement floods and it's just too late. If you have a backup and battery backup sump pump system in your home, it can give you the assurance you need that your basement is dry, and dry all the time! With a battery backup capable of pumping well over 11,500 gallons on a single charge, we have the system you need. The sump pump systems provided by Silver River Basement Systems are not the only sump pump designs on the market. There's a large variety of submersible sump pumps, pedestal pumps, water-powered sump pumps, and "floor sucker" models. Even among similar models, a small difference can be be the difference between a dry basement and a flooded one! What makes our sump pumps so much better than anyone else's? Your sump pump system contains mechanical parts (like the other appliances in your home), and these parts will eventually break down if not serviced. Silver River Basement Systems has a complete service team that is dedicated to ensuring that you can keep your system in optimal condition, while reexamining the basement to make sure no new problems have emerged. In one short visit, they can clean out your sump pump, test the system, and make sure that the battery and all parts are ready to keep your basement or crawl space dry next time it rains. If you live in Grand Junction, Farmington NM, Durango or anywhere nearby in the Colorado & New Mexico area, Silver River Basement Systems would like to offer you a free, no-obligation sump pump installation estimate and written quote. Before each estimate, we provide each of our customers with a free, full-color copy one of our 88-page books: "Dry Basement Science" or "Crawl Space Science". If you'd like to learn about how to properly fix your wet basement and take back your basement for storage and living space, call or contact Silver River Basement Systems online today!